A pretty remarkable movie, this film is more about the people than the monsters, and it is the story of the people that is so much more interesting and enjoyable. A pretty terrific movie, this monster creature feature actually excels when it is more about the humans than about the beasts. That means it tells a story where the creatures are really just background noise and take a backseat to everything going on with the main characters and their relationship. We’ve seen what happens when they do it the other way, and make the movie all about the creatures (the recent Godzilla is a good example, and ironically is by the same director, when he proved himself with Monsters, and was then suddenly given a much bigger budget.) There is a great story to this movie, very simple on the exterior, but pretty deep on the inside. I love the way the relationship changes between these characters and quite often in the film there are many questions raised which make us curious and wanting to see more. Like all great monster movies, this one doesn’t overdo the creatures and hides them as best as it can until the moment is right to really strike. It is also smart enough to not show closeups on the monsters, which always take us out of the movie because of how fake they look, (except for maybe with Pacific Rim, because those creatures were so damn cool.) This film is more about the human story and it all ends up working out to be pretty powerful and great. Monsters is a very cool movie about an alternate reality world where a space probe has come back into the atmosphere and landed in Mexico. There were lifeforms of some sort attached to it, and since that time, they have spread all over the northern parts of Mexico to the point where this area is now known as the infected zone. It has been quarantined and the United States has built a giant wall to keep all creatures and people in that area out. All of this happens before the first frame of the movie. It is told to us via screen titles, announcing the current state of affairs before the film begins. The situation is that a photographer for a magazine is sent to an area in Mexico, south of the infected zone, to find the daughter of the man who owns the magazine. She has come down there to see the creatures, and she got injured in the process. Now, at a hospital, the photographer, Kaulder (Scott McNairy,) comes to check on her and then receives a new set of directions when he touches base on the phone with the man who sent him. He now needs to make sure this girl, Sam (Whitney Able,) gets on a ferry and is headed safely back to the states. The movie is directed by Gareth Edwards, who went from this low budget indie take on a monster movie to the mega-budget film remake of Godzilla. Monsters is the movie that got him that gig. From Godzilla, Edwards is going on to direct one of the next Star Wars movies. The funny thing is, like many directors, less is more. Godzilla was just an okay film, overdoing it with the creatures and special effects. 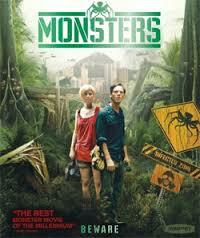 In Monsters, however, it is the limited times we see the creatures and the way this movie focuses so much more on the human story, that really makes it work. It’s kind of crazy to think about it, but the best moments in this movie, by far, are some of the ones that don’t involve any creatures. After taking Sam on a train to the ferry station, Kaulder and her have some negotiating to do. The man who runs the ferries wants 5,000 dollars. While they were traveling here, the two of them found out that they only have two days to get out of town before they close off the harbor indefinitely and discontinue all ferry service from that point on. I like the way this movie makes that scenario so clear, having Kaulder explain it point blank. It’s also the reason why the ferry ticket is so expensive. We get two different negotiation scenes with the man at the ferry station, and they are both fantastic, with that man not willin to budge on his prices and laughing off all of Kaulder’s attempts to get a better price. After buying the first ferry ticket, Kaulder and Sam now spend a night hanging out together, partying. At a certain point, she has had her fill of tequila shots and sitting by the water, and decides to call it a night. Kaulder stays out. Maybe it’s that he’s so upset about having to come all the way out here to take Sam to the ferry, when he was in the town he really wanted to be in (the place where he found her in the hospital.) He says something to this effect early on in the movie, when on the phone with the man giving him instructions, claiming that he has waited three years to get to this place, and now he has to leave it. Perhaps it’s all of this combined with the fact that Sam keeps rejecting Kaulder’s advances, that pushes him to bring a woman back to his room for the night without really knowing her at all. When Sam sees this, the next morning, she has a mild freak out, and runs away. Kaulder chases after her, leaving the woman in his room, and the next thing you know, he has been robbed. His camera is still there, but both his and Sam’s passports have been taken and without them, they cannot get on the ferry. 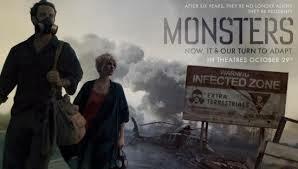 That leads them to buy tickets into the quarantined zone, traveling through the infected area by land. Even this takes some major negotiation to the point that when they finally get the tickets, Kaulder is willing to go on the trip with her. This has all been incredibly interesting. Whatever Sam’s reaction to Kaulder and that woman meant, makes us curious. Now, the two of them start traveling by motor boat and by land. This is where we begin to see some creature attacks. First there’s one in the water with their motorboat going dead and a broken down airplane rising to the surface of the water nearby. Just moments later, a creatures tentacles pop out of the water and pull the plane back down. Then when the two of them make it to the land and are traveling with a whole other crew, another creature attacks. Kaulder and Sam hide in the car while the creature single handedly kills every one of the men who is there. This scene is handled with minimal special effects. Sure we see the tentacles moving through the air, but regarding the deaths of the men, we just see them run out, hear machine gun fire, and listen to loud music. When the music goes dead and turns to silent, we know the men have all been killed. There is so much to like about this movie. Every human situation has such real dialogue that it makes you feel as if you are there, alongside the characters. Either that or it makes you wonder what you would do if it was you in their shoes. For example, when their driver takes them to the motorboat and there is just one man in the boat, ready to take them, they turn to their car driver and ask where the rest of the people are. Then they ask him if he is coming, worried when the answer turns out to be no. You can feel what they are feeling, the way that even though they don’t know this driver, he is still the only one they trust in this moment, and are not ready to just leave him for a complete stragner. Aside from the rich dialogue and cool human interaction scenes, there are also some pretty neat things about these creatures. At one point, while traveling with the group of men by foot, they see the reason why people say that the trees are infected. There are little baby alien eggs attached to the trees, growing out of them. The trees are where the creatures lay their eggs, and these eggs light up at night to look really cool. Once our two protagonists leave the land crew and start traveling by themselves, things slow down a little, but the movie finds ways to keep the plot interesting. It brings in the finding of some ancient temple ruins, for example. By the time we get to the climax, the plot is moving at full force. The movie doesn’t skimp on anything, including the monsters, but at the same time, it films them in such a way that they don’t look incredibly fake. The trick is to never show us them in closeup. If every shot of them is off in the distance, it has a sort of reality feel to it, like Cloverfield. The final shots of the movie are pretty incredible, and while there are some occasional slow moments here and there, overall this is a fantastic film.